The security certificate of the site expired today, however. Happens, but it is definitely something that the devs should address quickly. SmartAdblock is a set and forget kind of adblocker that blocks advertisement well. 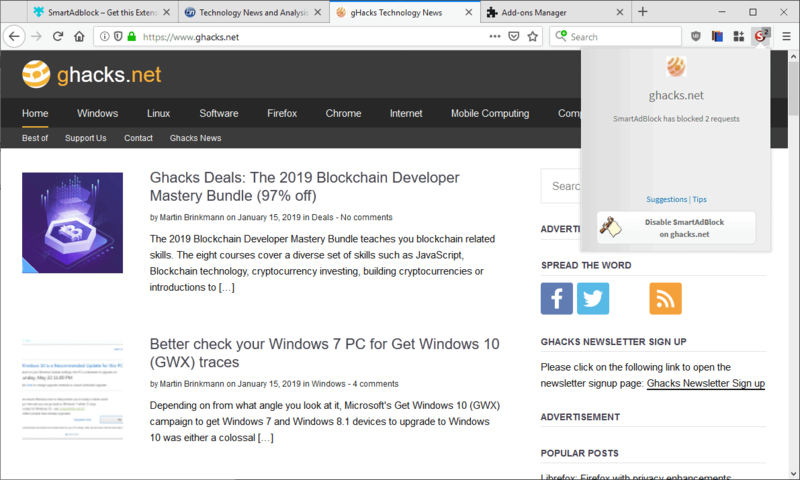 It is the extension's extra features, the bypassing of anti-adblock and privacy prompts, and the blocking of aggressive popup ads that make it stand out. I'd be interested in any study done between this and tried and true ublock origin. They will have to work very hard to place themselves with the already established providers. See the last option on this page. It's already available - need to be manually enabled though, in other addons there. I am in the developer team of smartadblock, and I am pleased to find this thread. We have started working on smartadblock because we believe we can bring something new in the field. For ublock origin fans usually I simply give them the example of webmd.com on ubo+chrome, ubo cant handle it and you will have ads (browse an internal page), smartadblock can. So our tech is different and sometimes better. We also wanted to solve the cookie warnings problem, and obviously if the fanboy easylist was enough ... we wouldnt have started coding at all. Fanboy cookie list doesnt solve the problem and breaks 40% of gdpr websites (when you browse them from Europe) SmartAdBlock is tacking this problem seriously. Chrome extension team is being a bit slow at validating our updates, but the 1.0.9 version coming in a few days will be officially the lightest adblocker in terms of memory usage, and will come with a lot of other goodies. In the meanwhile we would be glad if you joined us to give smartadblock a try and send some feedback (reddit r/smartadblock).